M2 Wn Hafen, Douglas Quay. 1 x Machine gun position. 4 x FT tank turret Tobruks of heavy machine guns or 3.7cm KwK 38. 1 x radio bunker/machine gun/observation bunker. 1 x R680 casemate for a 7.5cm Pak 40. 1 x Electricity Generator building. Braye looking at the very distinctive houses either side of Braye Street. To the left is a machine gun bunker (not on the plan). 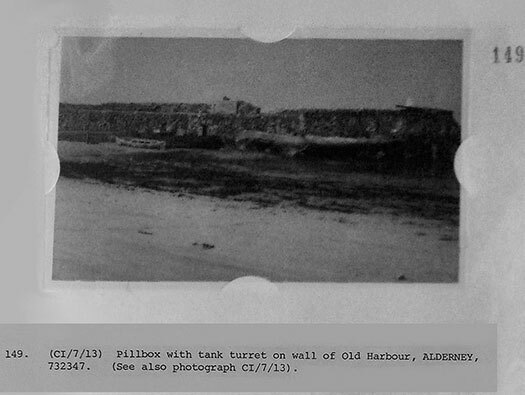 Hidden on the beach in front of the houses is a 4.7cm Pak K36(t) bunker and on the harbour wall a tank turret Tobruk and below the crane an R680 casemate for a 7.5cm Pak 40. M2 Wn Hafen the beach. 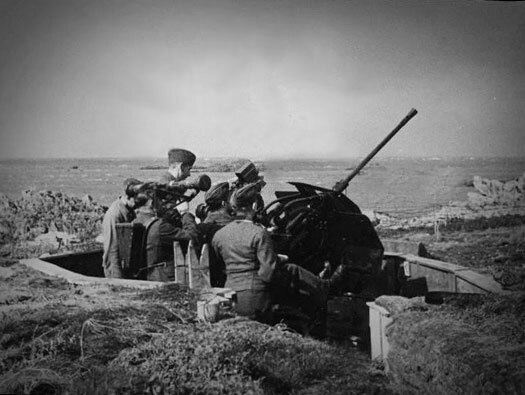 A machine gun position on the beach. M2 Wn Hafen Braye Street trench line. 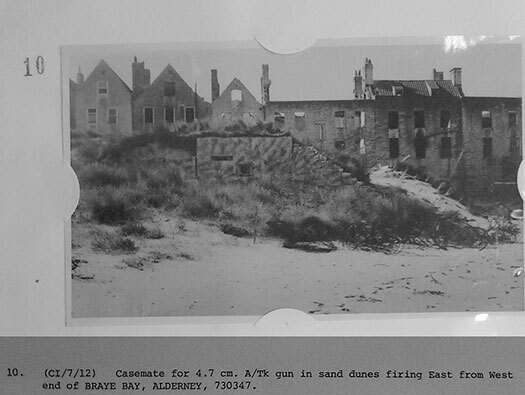 The back of Braye Street on the seaward side with a trench running off to the right leading down to a 4.7cm Skoda casemate. The Skoda casemate showing up down the trench line. 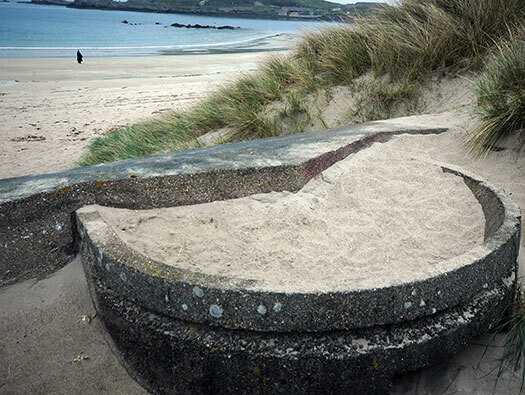 M2 Wn Hafen Braye Street machine gun bunker. Just to the right and behind the Skoda casemate is a machine gun bunker. Behind - Anti-tank obstacles. Front ---- Wire defence. M2 Wn Hafen Braye Street Skoda bunker. Skoda bunker a rectangular box with a fortress gun. M2 Wn Hafen Skoda bunker. Skoda bunker with the fortress mounting still in place after the scrap men had taken their fill post war. How the Skoda 4.7cm gun fitted into the casemate. 4.7cm Skoda Pak K (t) [t = Czechoslovakia]. 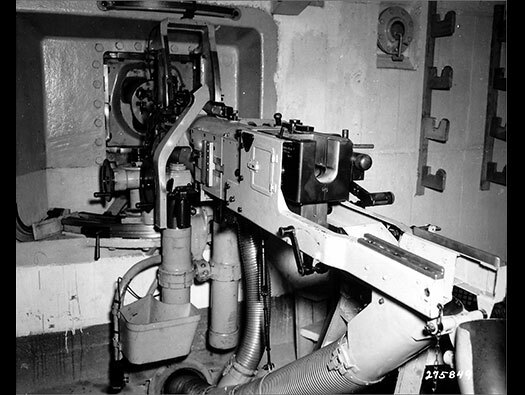 To the right and above the gun mounting is the gun commanders viewing slot. The area covered by the Skoda gun and the machine gun to the right. The viewing slit and Skoda gun fitting in the front. The 4.7cm Pak K (t) gun. 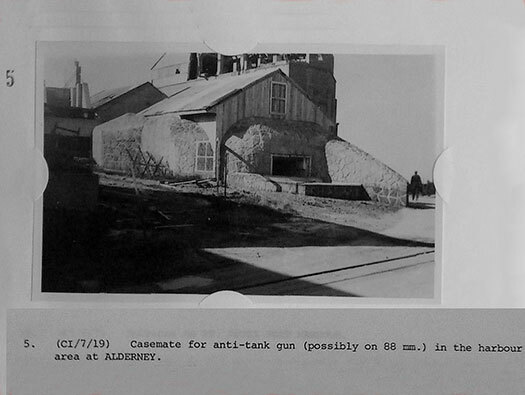 This is a post war photo of the Skoda Casemate in an allied document. Note the camouflaged paintwork and the destruction of the houses due to neglect and the wood stolen for fire wood. Probably mined, anti-tank obstacles and wire. M2 Wn Hafen Harbour Guard pier. 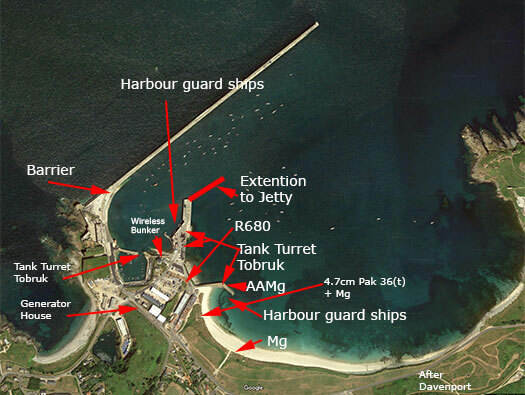 This short pier was used by the navy to tie up harbour guard boats and a tank turret Tobruk sitting half way along it. Allied photograph taken in 1945. M2 Wn Hafen Guard pier. FT17 turret with a heavy machine gun is probably the type of turret that was used here. Another picture of how it may have looked. Crew compartment one end and ammunition the other. Bunker either an air vent or a chimney pipe. Bunker heater, coal or wood could be used. The ring where the turret fitted. M2 Wn Hafen Braye Street. Most of these houses were derelict and the wood stolen for fire wood or building materials, there is no indigenous timber on the island. 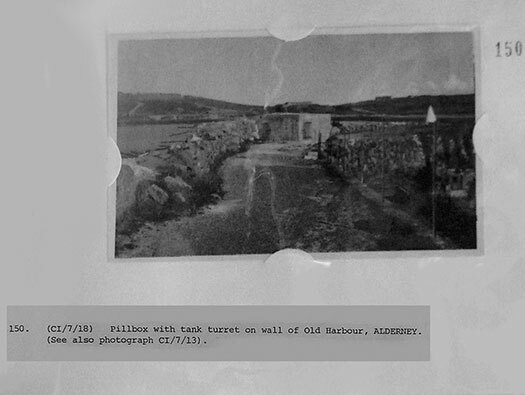 The bottom end of Braye St. with an R680 that was camouflaged as a house. M2 Wn Hafen Braye Street R680. The front of the R680 a casemate for a 7.5cm Pak 40 gun. A flanking wall now removed to help traffic using the road to pass. Two ammunition niches each side of the rear door and a centre gun room. 7.5cm Pak 40 gun being loaded. A contemporary picture of how the bunker was camouflaged. It says “Possibly an 88mm” well an easy mistake as the 7.5 & the 8.8 look very alike. A 7.5cm Pak 40 inside a casemate. The flanking wall now removed. More camouflage down the side. It looks like a Bf58c type. Tobruk in an AA roll. Attached to the end of the harbour was an extension built by the Germans from parts of a bridge to be used in Operation 'Seelöw' the attack on Britain in 1940. Out on the harbour was an air raid shelter, two Tobruks with a tank turret, two R656 15man bunker and a small bunker. Tobruk with a tank turret. M2 Wn Hafen Naval wireless bunker. I would like to thank Nigel for allowing us to visit the Wireless bunker and also later taking us to the Hospital bunker (more later on that). 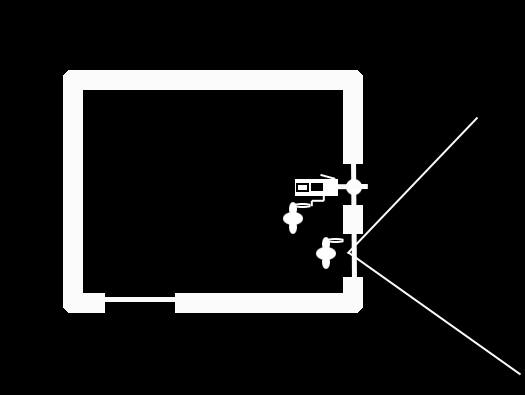 Plan of the wireless bunker. The entrance under the Harbour Masters Office. 90P9 steel cupola this concrete cupola is a copy. Presumably they did not have a steel cupola so made a concrete one. Under the grass is the concrete cupola. The concrete crossing the tunnel is the new Harbour Masters Office. Gun room for a heavy machine gun. MG inside a bunker like this one. Gun room showing the targeting details painted on the wall. But it may have been a heavy Maxim a WW1 machine gun here. Gun room showing the targeting details painted on the other wall. Another machine gun in a casemate. Another aperture in the rear wall for another machine gun and also more targeting information on the wall. A view of the bunker but here we have a steel plate for an embrasure being used as a roof. A metal plate being fitted into place. Metal plates stacked up ready for shipment to the Atlantikwall. I believe its a 7P7 metal plate used as a roof section. I suppose by opening the right hand aperture a machine gun could be used either in an AA or ground role and observation through the large shuttered hole. A 7P7 steel plate for a machine gun emplacement. 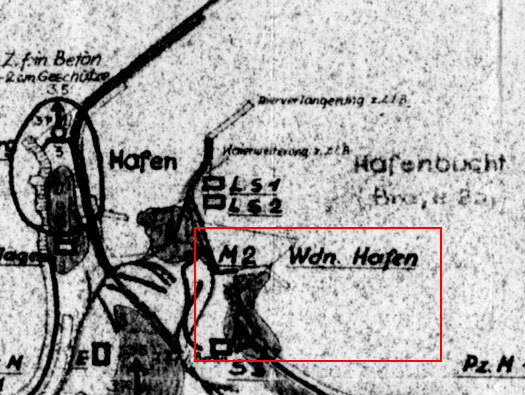 M2 Wn Hafen Naval wireless bunker . Within the passages there are a few odd bits and pieces and this is more of an air raid shelter. für 3 Mann leigend oder 6 mann sitzen. For 3 men or 6 man sitting]. Interesting that all the bunkers I have seen in France, this type I have never seen. Its an early design for the Siegfried line probably designed in the1930's to shelter soldiers at defences on the German border. There would have been two wooden planks down each side to sit on. For 3 men or 6 man sitting. A very round bunker, another I have never ever seen. What do you do with a square table?? 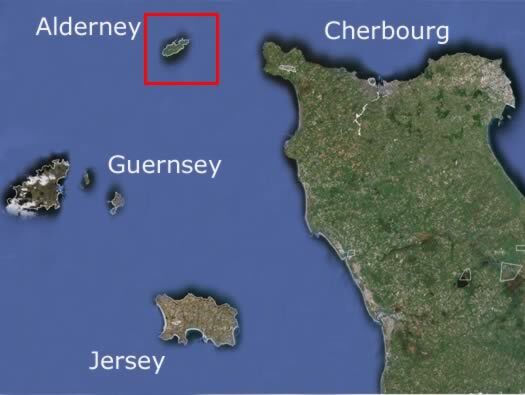 This radio room bunker and would probably radio not only local Alderney defences but the other Channel Islands and mainland France. On the top of the flat roof was a 2cm Flak. M2 Wn Hafen 2cm Flak 30. This is the sort of gun and mounting that was on the top of the bunker. 2cm Flak base mounting designs. Under the earth is a concrete version of a steel dome. Presumably a steel dome was not available and somebody crafted this one out of concrete. 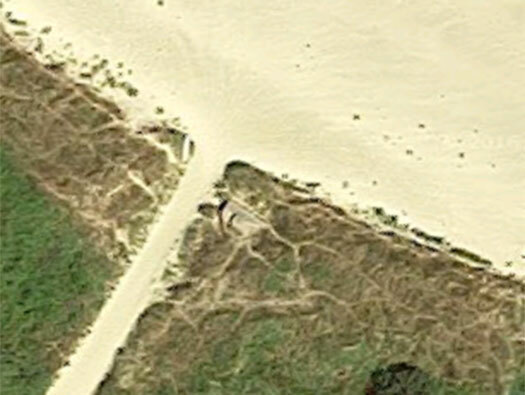 I have also found parts of a steel close combat defence embrasure made of wood on another bunker on the island. It may show that certain parts were not available and the builders on the island had to fabricate. Just to show the English were here first. WD = War Department. The broad arrow is the government sign or Pheon. Most Government military fortifications and here on Alderney there are many. Usually stone 1 is the key stone and then they run right around the site. The Army had WD, Royal Navy had RN, the RAF had AM. M2 Wn Hafen tank turret Tobruk. On the end of the short quay is a tank turret Tobruk. German naval trawler converted to gunboat and would be heavily armed. The Tobruk with two doors which is very unusual and sliding doors. An FT French tank turret was on the top. Many French WW1 and post WW1 tank turrets were used in the Atlantikwall, a light weight small turret firing either a heavy machine gun or a 3.7cm cannon. This model bunker the same design as the one on the other quay but this one has mountings for sliding doors of a type I have seen in bunker and in fact there is one in the medical bunker on the island. Tobruk ammunition room in a bunker higher up the hill. Vent pipe still with its grill to stop a hand grenade to be thrown in. Note the second door runner. A heater like this one may have been fitted into the crew side of the bunker. The turret ring still in place, they were either geared so turned by rotating a handle or they had a free running turret ring whereby you would use your shoulders to move the turret around. The geared ring on the mounting. Set into the stone walls Eisenpfahel would be spaced out and barbed wire entanglement placed around them.. There were also Teller mines and heavy old French shells wired up as mines all along the quays. Eisenpfahel is a stylised German support for a barbed wire entanglement. 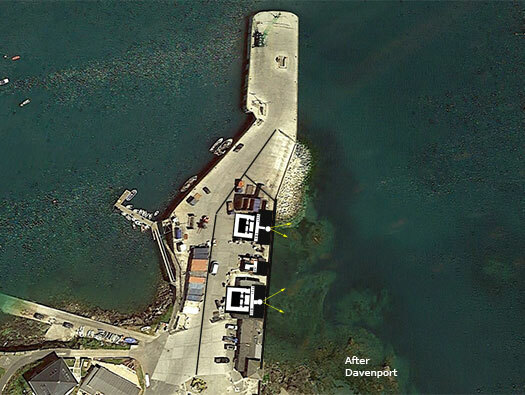 A barrier was built somewhere across the slipway to stop easy access to the breakwater and entry onto the island. 109C heavy generator. I do not know what type was used here. The view across M2 Wn Hafen.